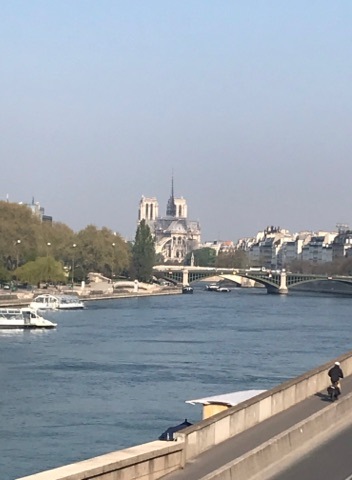 I can't imagine running to Paris for an emergency instead of for sheer pleasure, but that's what happens in That Spring in Paris by Ciji Ware. The story is told through the eyes of Juliet, a graphic artist working for her brother's video game business so that she can help preserve the money her father invested in it, and Patrick, who recently left the military to heal from his PTSD even though his father, a lifetime military man, doesn't approve of that decision. Juliet races to Paris after her best friend is injured during the November 2015 terrorist attacks. She physically runs into Patrick at the door to the hospital. Patrick is there to visit someone injured in the attack, too. The two begin to build a relationship and to untangle the complications they live with because of family demands. The book changes locations between Paris and San Francisco mostly. When I previewed this novel a few weeks ago, some people living in France thought it might be too soon to write about the terrorist attacks. I think the entire subject is handled delicately, and it doesn't exploit the devastation at all. The characters are struck with fear and PTSD every time another attack or scare arises and must heal again. Although the story is set against the backdrop of the terrorist attacks, the real plot focuses on the love story of two people who have given in to the will of their families rather than focusing on what they want in life. They give each other the strength to move forward to reach their own goals. He returned his gaze to the plate glass window just as the Eiffel Tower was suddenly illuminated with blinding brightness in shades of blue, white, and red. "Oh, look!" Juliet exclaimed, swiveling in her seat on the sofa. "How beautiful! They've turned the lights back on in the colors of the French flag! Isn't that a good sign?" The enormous structure's colorful outline was reflected in the water below it. "It'll never look the same to me." "No... not to you, it probably won't," she agreed. "Just like the space where the Twin towers once stood in Manhattan has never looked the same to New Yorkers...."
I realized after the attacks that the Eiffel Tower sat unlit, but I hadn't ever imagined how oppressive that might feel, to walk through the city at night without the twinkling lights, so when the lights came back on, it felt like a return to hope. Even though the event that set the travel to Paris in motion was negative, Juliet found herself falling in love with Paris, as most everyone does. I enjoyed the descriptions of her discoveries in the richness of life. I recommend this novel as a smart read with romance and deep dives into family issues along with the complications of war and violence. Such an intense subject. I enjoyed the excerpt. I'm looking forward to reading it. Thank you for the post and giveaway chance. Bonjour Paulita. J' ai aimé lire l' extrait du livre de Ciji ware " That's spring in Paris ". Il semble que cette fiction sur fond des attentats en France soit une belle histoire d' amour entre 2 expatriés mal dans leurs peaux.Je voudrais juste rajouter Paulita que Ciji Ware, ou tout autres écrivains, a tout à fait le droit d' écrire une histoire basée sur les attentats en France. Mais, ici, pour beaucoup de français il es t encore difficile de LIRE une fiction à ce sujet. Bien sûr nous devrons, comme les américains après les attentats du 11 septembre 2001, surmonter notre peine et vivre normalement.// Hello Paulita. I very liked reading the excerpt of " That's spring n Paris" by Ciji Ware.It seems that this fiction based on terror attacks in France is a beautiful and sensible love story between 2 expatriates ill at ease in their own life.I' d just like to add, Paulita, that Ciji Ware, or anyelse authors, are perfectly entitled to write a story based on terror attacks in France. But, here, for many french people, it's yet difficult to READ a fiction on this matter.Of course we' ll have to, like american people after 9/11 attack,overcome our sadness and live as usual.Just a last word to pay tribute to the victims of the cowardly attack in Barcelona. I wish you are well rest after your family vacation in Florida! Have a nice day.